With ballyhoos rigged, drags set, boat fueled, and iced, and a crew of me (Ricky Wheeler), Anthony, Joe, and Maureen with a collective of 6 hours of shuteye, we pointed the 27′ Contender Trade In for the Spencer Canyon after hearing some solid yft action in the canyons. We hit the tip of the Spencer and had lines in at 5:45 am after a beautiful ride. The water was 66 degrees and clean green which is where I was told the fish were. It didn’t take long to confirm the reports when we hooked into a single tuna on a green machine spreader bar at 6:30 am. Shortly after I marked squid on the bottom and in the middle of the water column and WHAM, 4 on! In the initial runs 2 came off and we quickly boated the other two to get lines back in immediately. At this point the fleet was starting to grow and I wanted to put together a catch before they were drivven down. We worked the same area in 80-100 fathoms on the West Wall of the Spencer about 2 miles from the tip the rest or the day. We picked at them consistently and put together our limit of yellowfin tuna from 25-45 lbs by 11:00 am. We also had a Blue Marlin on for about 20 seconds before it pulled off. the yellowfins were all over the spreader bars and daisy chains, and they seemed to prefer the chugger head/ballyhoo combos over the islander or sea witch/ballyhoo combo today. The fish were extremely agressize today skying out of the water onto the baits. It was amazing when we watched explosions behind almost every bait and connected with 6. We wound up 6/6 on that round which was a blast! 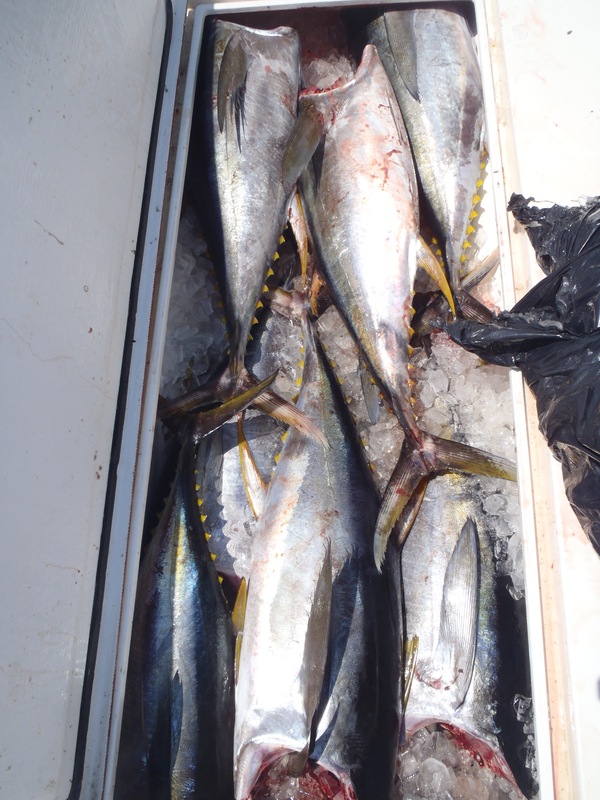 Box full of 30-40 pound yellowfins on the Contender. We brought the 6# test rods in case we did well because we wanted to attempt to get a yft on 6# test. Maureen would need a 40# yellowfin to beat the record. We gave this a shot after the melee and she was hooked up for about 2 minutes until the fish threw the hook. A new piece of water moved in and the fishing shut down. The temperature went from 66-71, and the color was blue green. This piece of water was pushing hard at almost 2 knots WSW. Hopefully it will bring in more fish and hold after this blow coming up. That being said, if I was running offshore again tomorrow, I don’t think I would run to the Spencer due tothis change in conditions.